It appears that Amir Khan has finally made his choice. Weeks of speculation as to the next steps for the Brit as well as that of unbeaten pound-for-pound king and welterweight titlist Terence Crawford were finally answered on Friday. Top Rank, whom promotes Crawford, announced a major press conference to take place on Tuesday, January 15 in London. Barring a curveball being thrown, the expectation is to reveal plans for an April 20 showdown between Crawford and Khan, which will likely headline an ESPN-distributed Pay-Per-View telecast. Such details weren’t revealed in a cryptic press release sent through Top Rank’s press office, other than to confirm that both fighters as well as Hall of Fame promoter Bob Arum and representatives from Matchroom Boxing—Khan’s promoter in the United Kingdom—will be on hand for the session. For months, Khan appeared to be on a collision course with longtime domestic rival Kell Brook, although the two spent more time bickering through the media than in coming to terms for a long-awaited all-UK showdown. Such a fight even was a major factor in Khan (33-4, 20KOs) signing a promotional pact with Matchroom Boxing earlier this year. He has fought twice under Matchroom’s banner, scoring wins over Phil Lo Greco and Samuel Vargas after having spent nearly two years sitting on a May ’16 knockout loss to Saul ‘Canelo’ Alvarez in Las Vegas. From the time between his win over Vargas and Brook’s scheduled homecoming versus Michael Zerafa last December, it was believed that the two would eventually reach a deal for a super fight in the first half of 2019. Promoter Eddie Hearn was even hopeful that Khan would turn out for the Brook-Zerafa card, which landed on his 32nd birthday and with the idea of announcing their fight shortly after the main event. Khan threw a major wrench into this plans, however, at the start of fight week. The 2008 United Kingdom Olympic Silver medalist and former 140-pound titlist dropped a bombshell in making public a lucrative offer from Top Rank to instead face Crawford. All parties involved acknowledged that Khan stands to make more in a domestic dustup with Brook, but he liked the idea of challenging whom believes to be the very best boxer in the world. His thinking was the public appeal for a Brook fight will always be there, as such a showdown will carry a theme of unfinished business more than any surrounding relevance. In getting Khan to mull over—and now seemingly agree to—such a fight, Crawford finally gets an opponent with a big name. The switch-hitting rising star from Omaha, Nebraska was lukewarm on the prospects of a proposed bout versus Luis Collazo, which was originally slated for March 23 at Madison Square Garden. Collazo—a 37-year old Nuyorican and former welterweight titlist—had long ago agreed to such a fight, where he stood to make a hefty seven-figure payday for his services. Crawford, on the other hand, never signed the bout agreement, instead reminding the Top Rank family of his desire for big fights moving forward. There’s no question a showdown with Khan carries the bigger event feel. The proposed clash will mark the second welterweight title defense for Crawford (34-0, 25KOs), who is coming off of a 12th round stoppage of previously unbeaten Jose Benavidez last October. The bout was frowned upon by most observers—and even several members of Crawford’s inner circle—but only went to show the 31-year old’s drawing power. 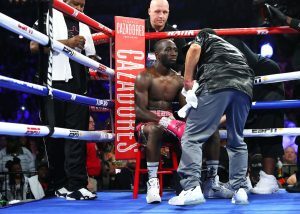 The ESPN-televised clash served as the most watched boxing event of 2018, drawing well north of 2 million viewers. As for the in-ring result itself, the feat marked Crawford’s 5th straight stoppage victory, also running his record to 12-0 (9KOs) in title fights spanning three weight divisions. Assuming that Tuesday’s press conference does in fact confirm a Crawford-Khan showdown, also expected to be part of the reveal is the destination for such a contest. New York’s Madison Square Garden was the originally targeted location for both the initially proposed March 23 date as well as April 20, although there remains a distinct possibility of the show landing in Las Vegas. Broner Warns Pacquiao: Look at My Resume – I Stop Southpaws!